Shepherd Clark is a unique artist, working in the art genres of performing, fine, decorative, and recording. The image is that of a figure skated on the ice, an art form which has it origins in Europe hundreds of years ago. Mr. Clark was the first skater to perform "Shepherd's Rings", an adaptation of The Olympic Rings. This occured at the 2016 World Figure Championships in Toronto, Canada. Figure Skating unites the four major art generes. Compulsory figures are the namesake of figure skating, and were the first Winter Olympic sport ever contested at the 1908 Summer Olympic Games in London. 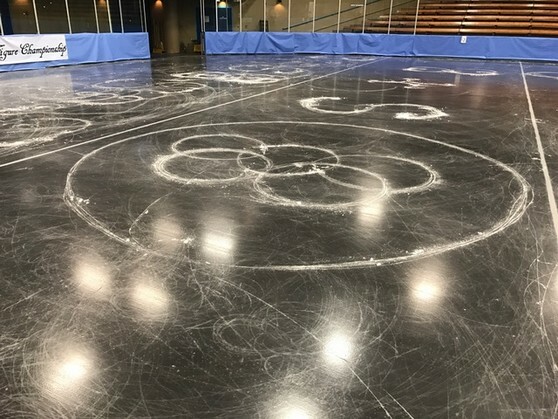 In this art form, the ice is the canvas, and the line is about one millimeter making the tracing of these designs extremely difficult. It is known that to be a master of figures on the ice, ten years is generally required of a skater. An additional challenge is for the skater to be able to master these designs under pressure in front of skating judges. When they are performed, only one skate may be used, so balance and coordination for the artist and athlete are essential. Many skaters attest to the heart and mind being as calm as possible. Overcoming nerves is a major facet of "The Jeweled Sport" where skaters dance on a crystal, wear jeweled costumes, and compete for gold. 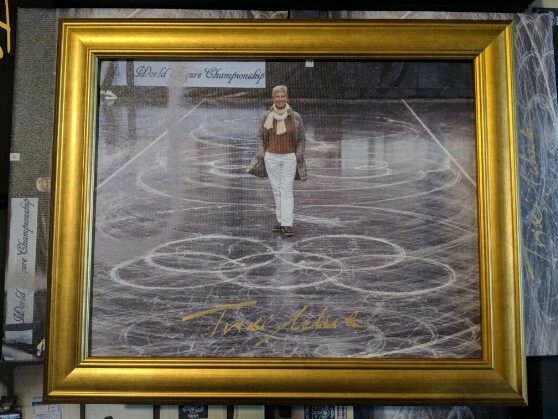 Trixi Schuba, The 1972 Olympic Figure Skating Champion, stands above Shepherd Clark's Olympic Ring Figure first performed at the 2016 World Figure Championships, held in Toronto. This photo is significant as it was taken by Shepherd Clark. 2016 was the first year of the modern World Figure Championship, that a special figure could be introduced by a competitor. Mr. Clark chose to invent this significant and symbolic figure, as figures happen to be the first Winter Olympic Sport ever contested, in London at The 1908 Summer Olympic Games. The Olympic Ring Figure introduces some new skating techniques which expand upon the versatility of skills needed to perfom the extremely difficult figure designs. Trixi Schuba is known to have skated the very best figures of all time in competition. Her pulse was once taken before a figure at the World Championships. It was only 60. Figures are the art form for which Figure Skating is named. It is a fine art form which requires absolute precision, as well as control of one's mind to overcome nervousness, as the tracing will reflect any imbalance in the body. In the history of figure skating, it is believed that not one skater ever scored a perfect 6.0 on a figure. In this art-sport, perfection is essentially an "impossible dream", which serendipitously was one of the music selections of Trixi Schuba at the 1972 Olympics, when she skated to Olympic Gold, unrivaled in the history of figures skating's namesake, "Figures".